January 2009 – Lori A.-O. I started a job 8 years ago and at my job, my employer was into stamping, so one day I asked her if she ever went to any classes and she said she did………so, I joined her at her class and the rest is history. I have always been a person who loves crafts, of some sort, most of my life. My sister just gave me a wonderful little gift about a year ago, it was my first ever, artwork, when I was a small child. I couldn’t believe it, it was a “window card”. I also received a few other cards from her, ones I had also made in grade school and was actually surprised to see techniques that had been around for that many years. These few cards now grace my stamp room in a frame. My favorite usually is the technique I am doing at the time, LOL……however, I would have to say my “all time favorite” has got to be the polished stone. So versatile. You really can never “goof-it-up”. Others I enjoy doing are acetate cards, cuttlebug, cricut and using foils under stickers. Lately it is the new Hero Arts, potted orchid and I also love anything with dragonflies, kimono, dragons & pandas. I have so many favorites, my tape gun (3M ATG), Heat gun & stickles. Jewel tones and of course, black, red and white (together). Would have to be ribbon, stickles and punches. Do not be afraid to jump in with both feet, the only way you will ever learn is if you give it a try. If you sit back and think, “oh, I can’t possibly do that,” it will never happen! However, if you at least give it a try, you may just surprise yourself and whatever you are making may be even better than you had expected. Everyone started somewhere; if we do our best, we will improve ourselves. Experiment. Also, send RAK’s and DAK’s and be in swaps, you can learn a plethora of interesting things in swaps. I have always enjoyed anything Asian/oriental. I have a sister-in-law who is Chinese, she has enlightened me on many things of her culture, which I have enjoyed hearing and seeing. I enjoy the serenity, the beauty and the colors of it, the interesting history as well. This group also has given me more inspiration than I ever imagined it could….thank you all. San Fransisco……….I have been there before and enjoyed being there…….not sure now how many places they have available, it was in the 1970’s when I was there last. I belong to way too many to list, however, I enjoy OSA as my main group and also I have a local store where I go at least three times per month for classes and crops. (I am also starting to teach classes there as well.) Most of my stamp groups on-line are swaps, DAK’s and RAK’s and COTM’s, etc. VSN, Stampers sampler, Take Ten, Rubber Stamper and a few others, whose names escape me. Hobbies: Mainly stamping and scrapping. Craft interests: Anything related to Art in any form, painting, sketching and color coordinating. Looking through tons of Blogs……Also, www.splitcoaststampers.com I have signed up for email from over 30 blogs, which usually have daily tutorials. If my part time job did not get in the way of stamping/scrapping, I could really do what I like, however, since we need a job to support our habits (hobbies), I will stick to my job so I can get those things I absolutely “need” in the stamping world. Floor tiles, plaster mesh, sand paper, yarn, shaving cream, nail polish, eye shadow make-up, wax paper, parchment, tin cans, cereal boxes, mica chips and backs of legal pads. Yes, I am a caregiver/housekeeper for a wonderful couple in a neighboring town. They own a rather large home and I do most everything needed to maintain it. I work approximately 25-30 hours a week there and come home to take care of our home as well. time for outside interests, however, my stamping keeps me rather active here at home. My stamp room is my haven, I cannot stay out of it for more than a day or so. I want to thank all the members of the OSA community for giving me so much inspiration. I am fortunate to belong to such a wonderful, talented group of artists. This card can be made in many ways. 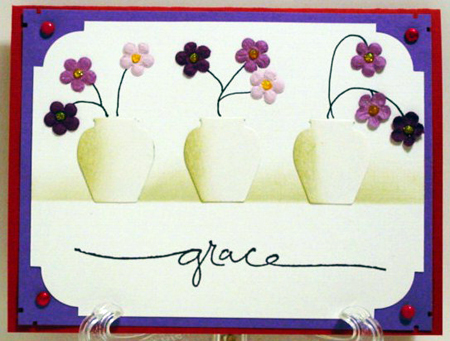 You can use punches, oval or round or you can use vase punches. 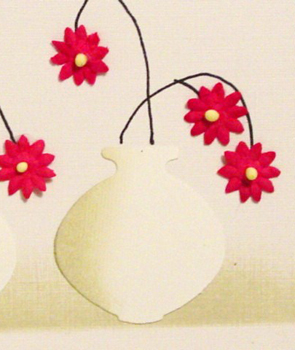 The vase punches come in many sizes. 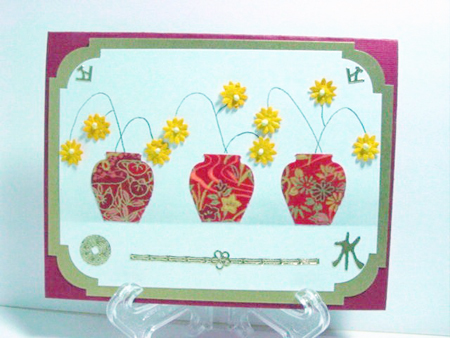 I have made several samples of the cards to show you how they turn out. 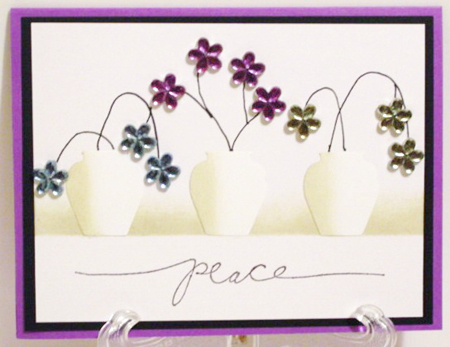 When making this card, you may also want to use tiny floral punches or floral embellishments to add to your vases. Choose the colors you want to use in your vases and also choose matching inks for shading your vases. 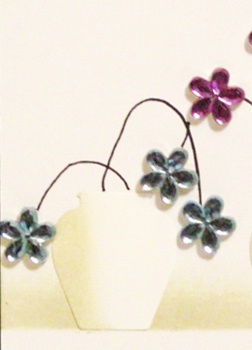 If you are making the oval punch vases, start by punching your vases out of the colored cardstock that you chose. Once the shape is punched out, clip off with a scissors a small amount for the top of your vase and a larger area of the oval shape for the bottom of your vase. Shade with your matching ink, either the left side or right side of all your vases with a cottonball or sponge, making sure it is always the same side of each vase. Punch out your flowers, in whatever color you chose, for putting at the top of your vase (or use your floral embellishments). Now you are ready to prepare your card front. Once you have cut your card front, about one inch or so from the bottom of your cardstock is where you will be doing your shading. Take another piece of scrap cardstock, as wide as the card front and about two inches deep, lay that towards the bottom of your card front, mask the bottom of the card front and using a lighter ink (I prefer a soft gray or cream colored ink)and a sponge or cotton ball, swirl it onto your ink pad and start swirling in a circular motion on top of the scrap piece, so that when you take the scrap paper away, it will have a shaded area only on the overlapped area of the cardfront/scrap paper. This will end up being the base for your vases to sit. 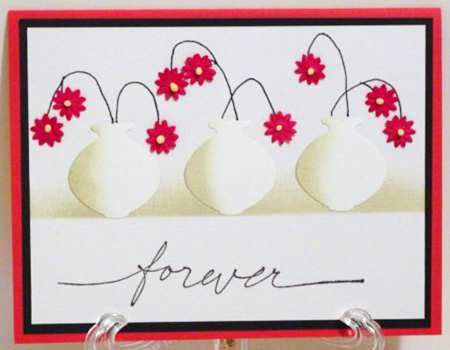 Glue your vases to the card front, lining them up on the shaded area. 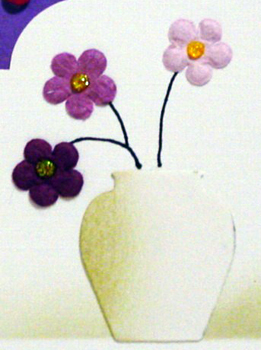 You may add stems if you choose or you may only want to put one flower at the top of the vase, your choice. I also used peel offs to enhance the card, you may also use punches for the corners or do whatever you wish, to make the card look finished. I also stamped words in the area under the vases, that is optional. I hope you try making one of these, I find the results very pleasing.